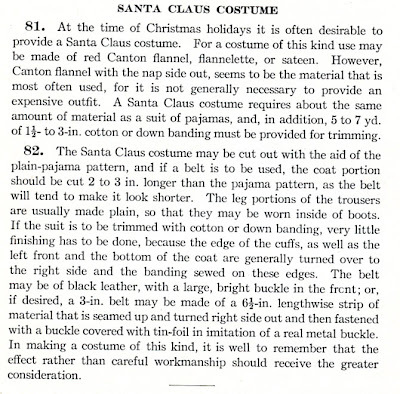 What the well-dressed Santa was wearing in the 1920s. The patent date listed is for 1921; I suspect the pattern is a few years later. McCall patterns of this era are really beautifully produced. I find the cover art very attractive. The decorative frames on both the front and the back of the envelope are a nice touch. The pattern pieces are printed on very good quality tissue - still flexible at 80 years old. My experience in making up McCall patterns of this period has been that the drafting is excellent and the garments go together very accurately, something that can't be said of some of the other patterns of the period. 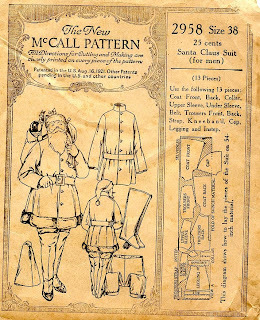 Unlike most patterns of this period, which were die cut, McCall patterns were printed on large sheets and the user cut the pieces apart on the cutting lines, just as we do today. According to the copy printed on the pattern, this way of printing patterns "insures absolute accuracy and eliminates that home-made look." Note the curved two piece sleeves to ensure a nice fit and drape. There is also a strap at the back waist of the trousers, to be furnished with a buckle. Santa likes a good fit. Here are some helpful hints from page 42 of Miscellaneous Garments, by Mary Brooks Picken, one of the Women's Institute of Domestic Arts and Sciences. The date on the cover is 1921; the copyright date is 1917. These days, the only time one sees canton flannel is for inexpensive work gloves; I've never seen it in any color other than white. But I suppose I can find a place for it in my life list of sewing projects. What kind of fabric would you propose? Velveteen is too tacky in one direction and red flannel is too tacky in the other direction. A good wool flannel would be nice. I would definitely go with a red wool, although Santas were often depicted in blue or green suits or red coats and blue or green breeches in the early 20th century. I'm going on the hunt for a copy of this pattern now that I know of its existence. There is also a 1930's era McCalls pattern that shows up now and again. The envelope illustration is in those wonderful, vivid '30s colors.